In the end, sophisticated customers want to know what they are giving up when they choose a keel over a daggerboard, or vice versa. Because it is difficult to bring together both a dagger-boarded and keeled version of each model for on the water testing, the Balance team elected to engage the University of South Hampton in the U.K. to produce Polar reports for the Balance 526 and new 620 models in either configuration. Once completed, these reports will be posted on the our website. 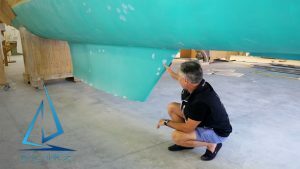 To see a brief video on this topic, and an example of a recent performance keel crafted for a Balance 526, please go right here.